making: ROBYN'S FETISH CHALLENGE # 217 "AT THE BEACH"
Hello to everyone this Sunday morning. It's sunny here and the weather is great. We have actually had two 90 degree days this past week and we are expecting two this coming week. Summer is really starting out with some heat. I'm glad that my daughter's soccer practices are in the early morning. I would rather be tired then really hot waiting on her. This is also the last week of June already. Pretty soon we are going to be thinking about Christmas. People always say Christmas in July. I have also seen count down on different blogs. I try and not look at them. I don't need a count down just yet. Fresh Brewed Designs is our sponsor for a great challenge this week. Who doesn't think about being at the beach? I think this was the perfect challenge since yesterday was the first of summer. All kinds of summer activities will be going on in the next couple of months and one of our favorites is swimming. I was glad that Fresh Brewed Designs let me use their digital image "My Island." Everyone always ask if you were on an island what would you like to have there. I would take my family. Fresh Brewed Designs has a great shop for you to go and look at. I would look because the prize that they are giving out this week is a great one. It is a great prize. For my little island this is the card that I made. I hope that you like it. I love the water paper. It really looks like you are surrounded by it. I love the sea animals and the lawn chair all by itself that I could use every once in a while. To make this cute card I used the following items. I am now going to stop rambling and let you get to your day. Can't wait to see the cards that you come up with and you can also see what the other designers made. They are very beautiful. Just go to Robyn's Fetish Challenge Blog and see the cards and then enter your. Feel free to leave any one of us comments. I love seeing what people think about my work. Enjoy your week and I will see you next week. 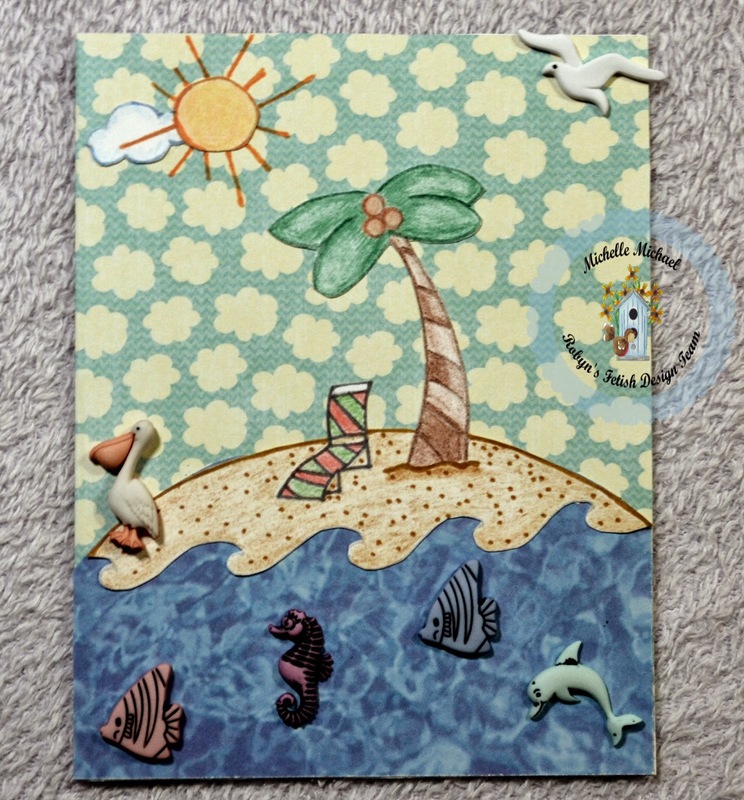 Beautiful card, I love the colors you used and how you created the little scene! LOVELY! I love how you made a little scene with these embellishments and the image. I just LOVE that little seahorse, too. The papers fit perfectly for this card. Great job! Thank you!